West Hampstead Life | Want a butcher? Why don’t you pay for it? Want a butcher? Why don’t you pay for it? Picasso’s – West Hampstead’s short-lived and misnamed pizzeria – is rumoured to be becoming another pizzeria. If true, probably a bad idea. Whenever a retail or restaurant unit becomes available, the clamour begins as everyone says what they’d like to see move in. No-one ever says “West Hampstead really needs another pizza place” but without fail, hordes will ask why we can’t have a butcher. Clearly, walking to Waitrose, which has a very good butcher’s counter, or waiting until Saturday for the (admittedly expensive) farmers’ market stalls, isn’t an option for these people. I would love a butcher to open here, but I’m also realistic about its chances of survival. It is a pretty hard business to run these days: competition from the supermarkets, the requirement for fresh stock and sizeable and expensive-to-run refrigeration space and the fact that, for all the baying of West Hampstead would-be customers, a lot of people still baulk at the idea of paying indepdendent-retailer prices for their meat. Hampstead Butcher & Providore, which has premises on Rosslyn Hill, was looking to move to West Hampstead a couple of years ago, but then pulled out quite late in the day. It wouldn’t say why, but one has to assume that the deal didn’t make financial sense. No great surprise. Where do you buy most of your meat? I’d happily buy from a local butcher, but would I buy into a local butcher? Would I invest in it as a business? No. I don’t believe there are enough people locally who would shop there regularly enough to make it a viable operation. Sure, it would be popular on Saturdays, and if it was smart enough to operate like a traiteur and stay open until 8pm, then it might do well with the commuters, but sadly I don’t think that would be enough to keep it going long term. I came across this article the other day, which sums this up rather neatly. The narrative would usually go that big supermarkets are destroying the variety we all apparently love in our local high street, with many independent retailers going to the wall as a result. It always struck me as odd that if so many people supported local retailers, how they could be in such financial strife. There was clearly a disconnect between the numbers supporting them verbally and those supporting them financially. Exactly. Enter crowdfunding – the capital-raising tool du jour, beloved of everyone from Amanda Palmer to Ubuntu. The idea is simple, a business venture asks the general public for money. If it reaches the target then it can proceed with its idea. If not enough people pledge money, then nothing happens and no-one’s any the worse off. Community Sourced Capital, based in Seattle, is seeing whether this idea could work to help local retailers; although there’s a twist – these are interest-free loans rather than donations. [It] asks people to lend money in $50 chunks, up to a maximum of $250 per project, with each project able to borrow up to $50,000. These funds are then made available to borrowers at zero interest, with repayments made according to income levels. Once members have had their loan repaid, they can either withdraw their funds, or invest them into another project. The founders of CSC want it to be more akin to lending money between friends rather than the more traditional commercial model, and as such each loan is simple and un-complicated. The notion is that is an interest-free leg up for an existing local business, rather than a considered investment with a return. Does this mean lenders are more willing to take a gamble? Less interested in scrutinising the balance sheet and business plan? CSC doesn’t say what happens if the business goes bankrupt. With small sums of money at stake for each investor it’s possible that the loan is simply written off. What do you think? 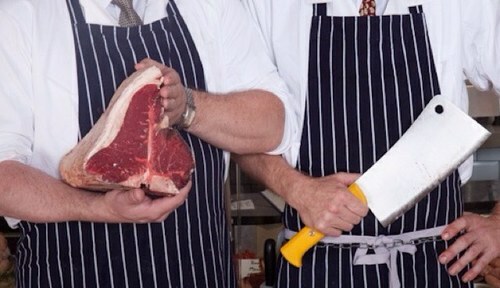 Would you lend someone up to £250 to get a butcher’s off the ground?